Former Merlin Olsen debate partner becomes Logan High’s second Nobel winner in four years. 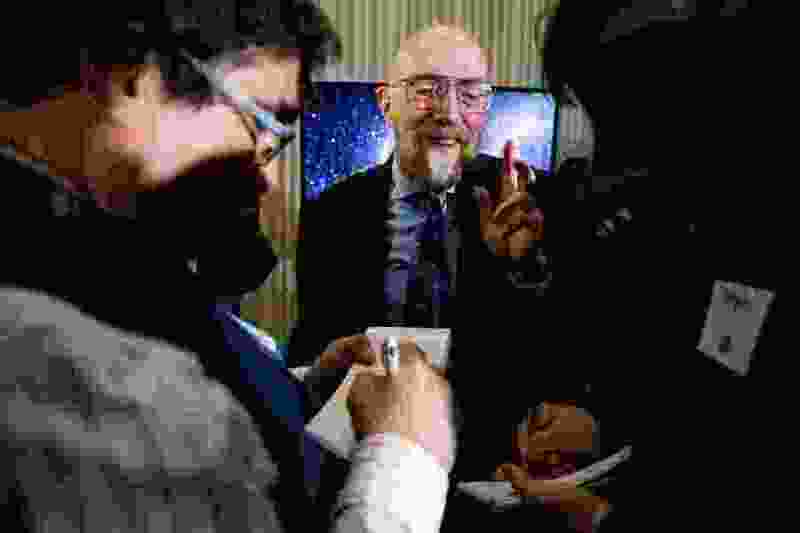 Logan-born Kip Thorne has won a share of the Nobel Prize in physics for his role in the historic detection of gravitational waves, which gave scientists something like an ear to deeper, darker reaches of known existence. An announcement was made early Tuesday morning at the Royal Swedish Academy of Sciences that Thorne will share the prize with the Massachusetts Institute of Technology’s Rainer Weiss and Caltech’s Barry Barish. Thorne, 77, is regarded as one of three co-founders of LIGO (short for Laser Interferometer Gravitational-wave Observatory), which in September 2015 recorded the gravitational wake of two black holes that collided 1.3 billion light-years from Earth. It was a final test of Albert Einstein’s theory of relativity, validation of a wholly new way to observe the universe. And, for Thorne, it was the culmination of a life’s work that began with him, at age 8, trying to plot the relative size and distances of the planets in rural Logan. Thorne told The Salt Lake Tribune by phone Tuesday morning that the prize should have gone to the whole team of 1,000 scientists credited with the 2015 discovery, “but I‘m just pleased to be, in some sense, an icon” for their work. Thorne has long been a theoretical physics rock star, if a tier below friends Carl Sagan and Stephen Hawking in popular renown. He famously beat Hawking in a wager about the existence of black holes, earning a year’s subscription to Penthouse — a playful joke on his Mormon roots. Granite High graduate Vern Sandberg is lead scientist at one of LIGO’s two observatories — his in Hanford, Wash., the other in Livingston, La. — where the telltale “chirp” of the faraway cataclysm was recorded. He first heard Thorne speak at a University of Utah physics seminar in the late 1960s and studied under him as a graduate student at Caltech. Thorne is “the hardest-working individual I’ve ever met,” Sandberg said in advance of last year’s Nobel Prize announcement, when the LIGO founders were thought to be shoo-ins. “He’s also an extremely decent human being,” he said. Former University of Utah physics professor Richard Price — once Thorne’s graduate assistant — said Thorne is as notable in the field for his selflessness as his theory. When they collaborated on Price’s first published paper, Thorne insisted that Price’s name be first — “even though my only contribution was to inject a few errors,” Price joked. Thorne was the oldest of five children born to Alison and D. Wynne Thorne — the former the first woman to earn a doctorate in economics at Iowa State, the latter Utah State University’s first vice president for research. At age 8, after Kip was fascinated by an astronomy lecture that Alison had taken him to, they resolved to make a scale model of the solar system. First, Alison Thorne wrote in her memoir, “Leave the Dishes in the Sink,” they had used a long strip of shelf paper pinned up along a kitchen wall. They could replicate the scale of the planets — a Jupiter 30 times as wide as Mercury, for instance — but not the distances between the planets. Thorne’s work ethic was apparent at an early age. He delivered the Logan Herald Journal and was a salesman at S.E. Needham Jewelers. He also played the clarinet and saxophone, was on the debate team with Logan High classmate Merlin Olsen (the football Hall of Famer was the best man at his first wedding), and made his first appearance in The Tribune in March 1958 as the 17-year-old winner of a science honor. His 1,800-word paper was called “A Four-Dimensional Geometry.” He’d asked Alison Thorne to type it up for him because she made fewer mistakes, and then left on an overnight hike with friends. 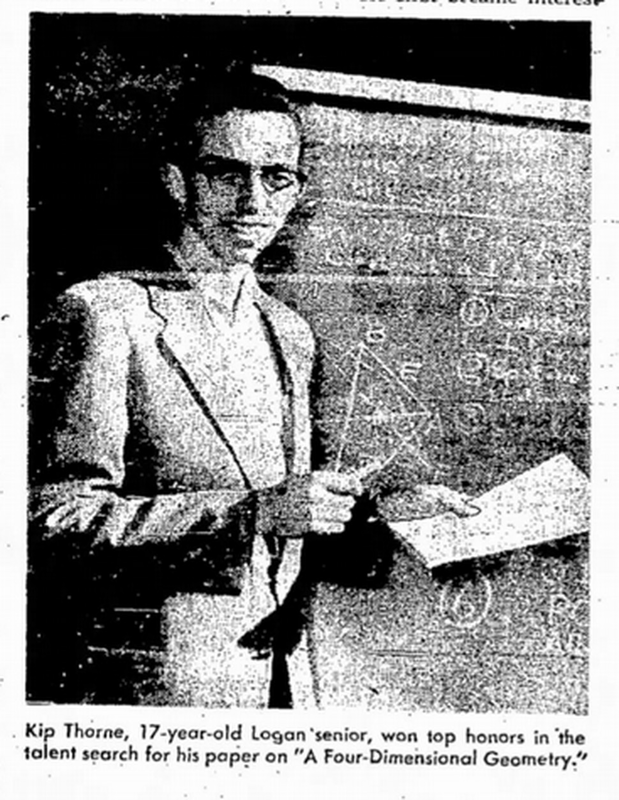 (Tribune file photo) Kip Thorne makes his first appearance in The Salt Lake Tribune as the winner of a science competition in March 1958. Kip Thorne went on to study at Caltech under theoretical physics luminary John Wheeler and was a full professor by age 30. His work on gravitational waves had already begun by then, but it would be nearly a half-century before the forces of funding and technology caught up to these unknown forces of nature. The “interferometers” were designed by University of Glasgow experimenter Ronald Drever, who died in March (and was therefore not eligible for a share of the prize). Scientists are able to detect the waves by firing laser beams through two 2 1/2-mile-long perpendicular vacuum tubes with mirrors at each end. When space-time is distorted by a gravitational wave, so too are the mirrors and the beams — though by as little as one-ten-thousandth the diameter of a proton. “There are only two kinds of waves that can propagate across the universe, bringing us information about what‘s going on,” Thorne said Tuesday. Electromagnetic waves such as visible light and radiation have been studied for more than 400 years, since Galileo’s time. “Gravitational waves will be similar,” he said. The LIGO observatories have continued to detect gravitational wave events, joined this year by another team’s detector in Italy that allows scientists to triangulate the origin of the signals. Weiss received half the prize, committee members said Tuesday, for spearheading the work that became LIGO while at MIT, and nurturing it to life along with Thorne and Drever. Thorne, who persuaded Caltech to get into the business of detecting gravitational waves and led LIGO’s first steering committee in 1984, split the other half of the prize with Barish, who was credited for scaling the project up as LIGO’s director from 1997 to 2006. Columbia University astrophysics professor Janna Levin, who chronicled LIGO in “Black Hole Blues and Other Songs from Outer Space,” quoted Weiss as saying he was flailing — falling behind competition and struggling to obtain funding — until he met Thorne. Thorne still returns to Utah for family and class reunions — next year will be his 60th — and was an adjunct professor at the University of Utah from 1971 to 1998, though he didn’t teach any courses. Descendants of Mormon pioneers, his family became disillusioned by The Church of Jesus Christ of Latter-day Saints and left the faith. But Thorne, now an atheist, said he is still close to members of his extended Mormon family. He becomes the third recent Nobel Prize winner to have graduated from a Utah public school. Fellow Cache Valley native and Logan High grad Lars Peter Hansen received the Nobel Prize in Economic Sciences in 2013, while Provo’s Paul D. Boyer was awarded the 1997 prize in chemistry. Correction: This story previously misstated the period Barry Barish was director of LIGO, which was from 1997 to 2006.